Underwater robots developed by researchers at Scripps Institution of Oceanography at the University of California San Diego offer scientists an extraordinary new tool to study ocean currents and the tiny creatures they transport. Swarms of these underwater robots helped answer some basic questions about the most abundant life forms in the ocean—plankton. The new study published in the Jan.
24 issue of the journal Nature Communications. Scripps research oceanographer Jules Jaffe designed and built the miniature autonomous underwater explorers, or M-AUEs, to study small-scale environmental processes taking place in the ocean. The ocean-probing instruments are equipped with temperature and other sensors to measure the surrounding ocean conditions while the robots “swim” up and down to maintain a constant depth by adjusting their buoyancy. 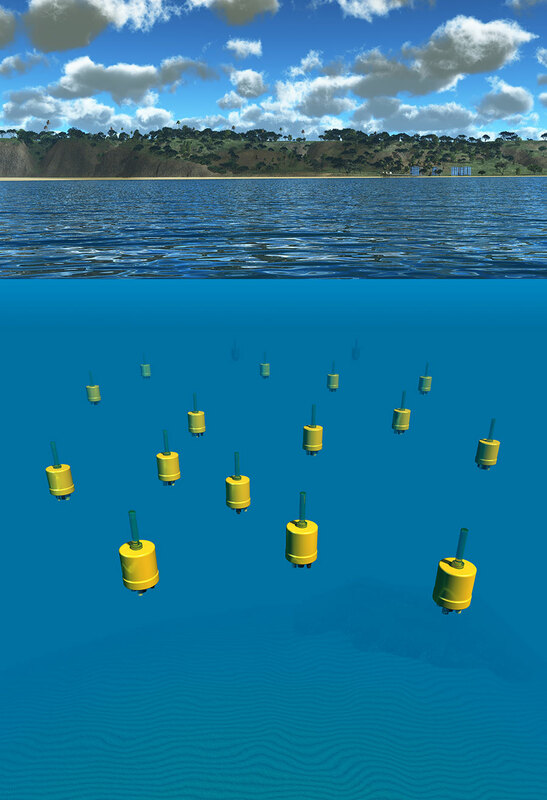 The M-AUEs could potentially be deployed in swarms of hundreds to thousands to capture a three-dimensional view of the interactions between ocean currents and marine life. A group shot of the M-AUEs in Jaffe’s lab, awaiting deployment. In a new study published in the Jan. 24 issue of the journal Nature Communications, Jaffe and Scripps biological oceanographer Peter Franks deployed a swarm of 16 grapefruit-sized underwater robots programmed to mimic the underwater swimming behavior of plankton, the microscopic organisms that drift with the ocean currents. The research study was designed to test theories about how plankton form dense patches under the ocean surface, which often later reveal themselves at the surface as red tides. Two decades ago Franks published a mathematical theory predicting that swimming plankton would form dense patches when pushed around by internal waves—giant, slow-moving waves below the ocean surface. Testing his theory would require tracking the movements of individual plankton—each smaller than a grain of rice—as they swam in the ocean, which is not possible using available technology. A video of the deployment of the M-AUE drifters at sea. Jaffe instead invented “robotic plankton” that drift with the ocean currents, but are programmed to move up and down by adjusting their buoyancy, imitating the movements of plankton. A swarm of these robotic plankton was the ideal tool to finally put Franks’ mathematical theory to the test. “The big engineering breakthroughs were to make the M-AUEs small, inexpensive, and able to be tracked continuously underwater,” said Jaffe. The low cost allowed Jaffe and his team to build a small army of the robots that could be deployed in a swarm. Tracking the individual M-AUEs was a challenge, as GPS does not work underwater. A key component of the project was the development by researchers at UC San Diego’s Qualcomm Institute and Department of Computer Science and Engineering of mathematical techniques to use acoustic signals to track the M-AUE vehicles while they were submerged. A graphic representation of the underwater explorers off the coast of Del Mar. During a five-hour experiment, the Scripps researchers along with UC San Diego colleagues deployed a 300-meter (984-foot) diameter swarm of 16 M-AUEs programmed to stay 10-meters (33-feet) deep in the ocean off the coast of Torrey Pines, near La Jolla, Calif. The M-AUEs constantly adjusted their buoyancy to move vertically against the currents created by the internal waves. The three-dimensional location information collected every 12 seconds revealed where this robotic swarm moved below the ocean surface. A video that illustrates the trajectories of the M-AUE vehicles over the 5 hour experiment that was performed offshore of Torrey Pines, San Diego, on Oct 1, 2013. The results of the study were nearly identical to what Franks predicted. The surrounding ocean temperatures fluctuated as the internal waves passed through the M-AUE swarm. And, as predicted by Franks, the M-AUE location data showed that the swarm formed a tightly packed patch in the warm waters of the internal wave troughs, but dispersed over the wave crests. “This swarm-sensing approach opens up a whole new realm of ocean exploration,” said Jaffe. Augmenting the M-AUEs with cameras would allow the photographic mapping of coral habitats, or “plankton selfies,” according to Jaffe. An animation of the high-frequency internal wave temperature anomalies moving through the M-AUE swarm during a deployment offshore of Torrey Pines, San Diego, on Oct 1, 2013. The animation shows a plan view following the center of mass of the swarm. The numbers show the locations of the individual M-AUEs. The research team has hopes to build hundreds more of the miniature robots to study the movement of larvae between marine protected areas, monitor harmful red tide blooms, and to help track oil spills. The onboard hydrophones that help track the M-AUEs underwater could also allow the swarm to act like a giant “ear” in the ocean, listening to and localizing ambient sounds in the ocean. Jaffe, Franks, and their colleagues were awarded nearly $1 million from the National Science Foundation in 2009 to develop and test the new breed of ocean-probing instruments.